Say what you like about Samsung but the company certainly isn’t afraid of trying new, innovative, and interesting things once in a while. On more than one occasion the firm has been the first to hit the market with some new fangled tech, and on a few times it’s been something no-one else had the gall to try – like the first Galaxy Note phablet, for example. Sure, sometimes it gets a bit ahead of itself and does something too wacky, or implements a good idea in a slightly odd way, but sure enough sometimes things work out great. Samsung wasn’t the first to market with a curved display design, however, as we’ve seen curved display panels before on things like LG’s G Flex. But previously such clever design has still prompted questions over the practical purpose – why does a phone buyer need a curved display? The Galaxy Note EDGE seems to be a bid to address that very astute question, and it does appear that there’s more on offer here than a curved screen for the sake of it. We’ve been putting it through the paces for the past week or so in order to find out if it actually is worth more money than the already excellent Samsung Galaxy Note 4? The Samsung Galaxy Note EDGE is a proof of concept, a means for Samsung to be able to say, “Hey, look what we’ve done!” And that’s great –– we need more conceptual stuff like this in tech. It is rather gimmicky, yes, but the handset itself is already built on some VERY strong Galaxy Note 4-type foundations. And it shows, too –– the handset itself is bloody brilliant, bringing nearly everything that made the Note 4 great and adding in a few extra bits for good measure. The EDGE display –– especially inside the Galaxy S6’s metal chassis –– costs Samsung A LOT to make, even more than Apple’s top of the range iPhone 6 Plus. According to IHS Display, the Galaxy S6 EDGE costs Samsung $290 to build. But a HUGE chunk of that cost is the display itself which costs $84 per unit. Factor this into the mix and it’s no wonder Samsung charges a premium for its EDGE version handsets. 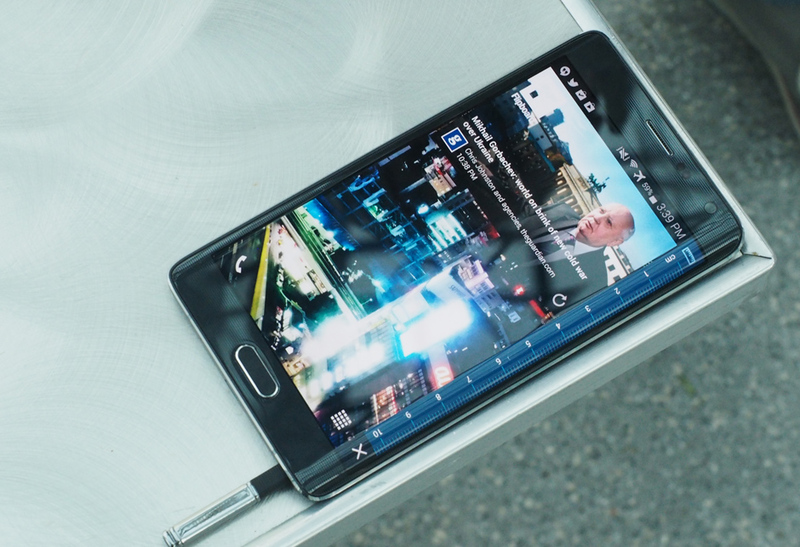 As predicted in this review, the Galaxy Note EDGE was a proof of concept device, a means for Samsung to test the water ahead of committing to a HUGE run of Galaxy S6 EDGE units. Consumers and reviewers alike seem to adore what Samsung is now doing in the design department; no other handset manufacturer is even remotely close to achieving was Samsung has with its EDGE series handsets. The result of all this hard work –– and the Galaxy S6 and Galaxy S6 EDGE really were a labour of love –– was a HUGE reception at MWC 2015, tens of millions of orders from networks, an insanely positive response from consumers and reviewers alike and, most importantly, a very positive improvement to Samsung’s bottom line in 2015/16. Moving forwards, Samsung seems keen to impress on all that it can now build these types of displays in larger quantities, which is good news for consumers and even better news for Samsung’s additional business dealings a display-maker for hire. The EDGE features metallic edging just like the Alpha and measures at a respectable 151.3 x 82.4 x 8.3 mm. It feels premium in the hand and, because of its careful design attributes, is also pretty easy to use one handed. Next to Apple’s iPhone 6 Plus (my daily driver), the Galaxy Note EDGE feels A LOT more manageable. As of February 13 2015, Samsung’s Android Lollipop 5.0.1 update for the Note Edge has been spotted rolling out to devices in Europe, it started in Poland but has quickly hit other regions including the UK, France, and Germany. Australia is a pretty significant market for Samsung so it’s perhaps not surprising that it has begun rolling out the Android Lollipop 5.0.1 update for Galaxy Note Edge handsets in the land down under too. If you live in the region be sure to check your Note Edge for OTA updates. We’re now hearing details of exactly when we should expect to see Samsung’s range of Galaxy devices pushed onto Android Marshmallow 6.0. There have been multiple leaks inside November 2015 showing Samsung’s update roadmap, with the most recent emerging on November 19 via PhoneArena’s anonymous inside tipsters. 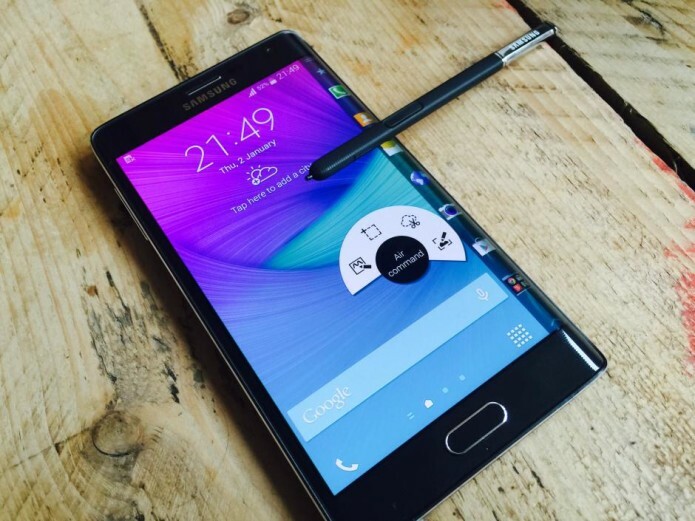 Consistently, these leaked details have shown the Galaxy Note EDGE will be updated, along with the Galaxy Note 4, in February 2016, following updates being issued to the Galaxy Note 5 and Galaxy S6 edge+ in December, and the Galaxy S6 and Galaxy S6 edge in January 2016. According to an official Samsung blog post which followed the launch of the Galaxy S6 edge+ and Galaxy Note 5 phablets, the company has been hard at work on implementing Android M features into its next version of TouchWiz, destined to land inside a number of high-end Galaxy devices. Amongst the devices mentioned in leaked details, the Galaxy Note 4 and Galaxy Note Edge are listed for the impending update. The post includes an infographic detailing the key features included in TouchWiz, such as improved power saving, memory tracking, app managment, and more.